In patients with cerebro-hepato-renal (Zellweger) syndrome, the absence of peroxisomes results in an impairment of metabolic processes in which peroxisomes are normally involved. These include the catabolism of very long chain (>C22) fatty acids, the biosynthesis of ether-phospholipids and of bile acids, the catabolism of phytanic acid and the catabolism of pipecolic acid. Many diagnostic tests for Zellweger syndrome have become available in recent years. In classic Zellweger syndrome abnormal C27-bile acids, very long chain fatty acids, dicarboxylic acids and pipecolic acid accumulate in the plasma of the patients. Moreover, depending upon the diet, plasma phytanic acid concentrations may be elevated. In platelets the activity of acyl-CoA: dihydroxyacetone phosphate acyltransferase is deficient; in erythrocytes from young (<4 months) patients the plasmalogen content of the phospholipids is decreased. In cultured fibroblasts from skin and from chorionic villus and cultured amniotic fluid cells from Zellweger patients the plasmalogen level is lowered; there is a decreased activity of acyl-CoA: dihydroxyacetone phosphate acyltransferase, alkyl dihydroxyacetonephosphate synthase and phytanic acid oxidase; thede novo biosynthesis of plasmalogens and the peroxisomal β-oxidation of fatty acids are impaired and the intracellular localization of catalase is abnormal. 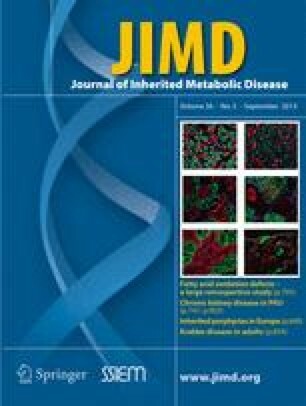 Dietary treatment of patients with Zellweger syndrome has not so far resulted in an objective clinical improvement. As Zellweger syndrome is usually fatal in early life, prenatal diagnosis of the disease is important.